Its time for A Charming Winter release!! 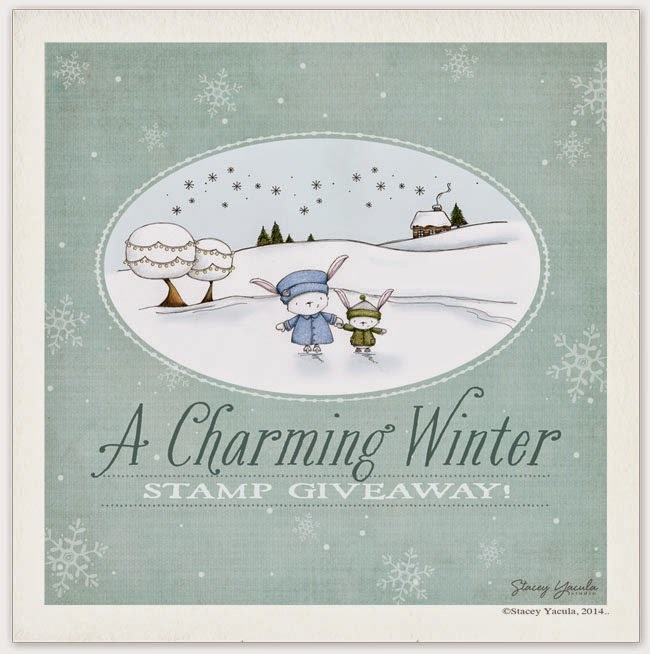 Today Purple Onion Design is releasing a amazing winter collection of stamps designed by Stacey Yacula. I love each and every image from this release...very cute!!! 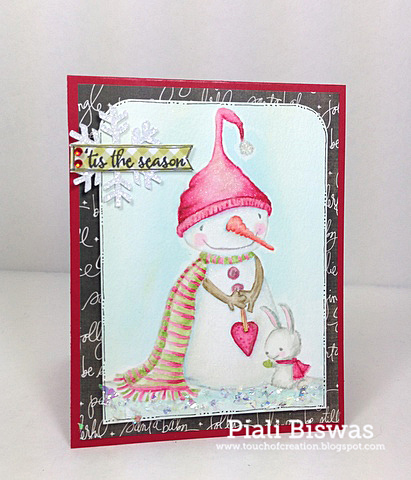 I used Warm Hearted image for my card..
A sweet image with a Snowmen and a cute lil' bunny!!! The sentiment is from the same set...'tis the Season. I stamped the image on watercolor paper with SSS- Fog ink... and did some no-line water coloring with Distress inks. I love the soft look on this card. The DP is from Heidi Swapp holiday collection. I also added some chunky snow glitter and Wink Of Stella glitter for a festive sparkle. Christmas Stampin' All Year Long - Photo Inspiration. Hope you all like this card! Make sure to visit POD BLOG to check out all the amazing DT creations. 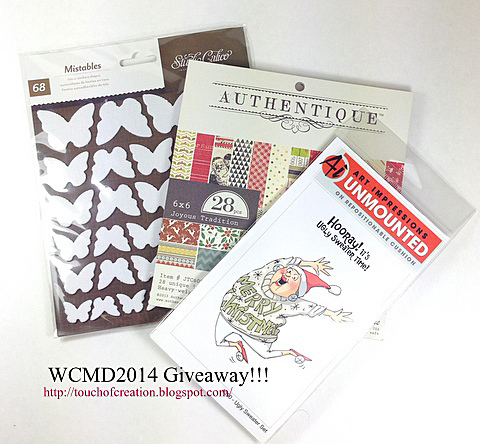 Here is something that will make a crafter's weekend more fun... an AWESOME new GIVEAWAY!!! 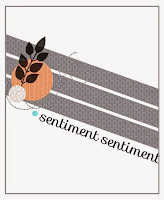 Purple Onion Designs will be releasing an amazing new Winter Stamp Collection designed by Stacey Yacula. You all get chance to win THIS new stamp collection. Not one but TWO chances!!! Michele and Stacey are each giving away the whole collection. All you have to do is head over to their blogs and leave a comment for your chance to WIN by midnight EST Sunday, October 26th, 2014. ! Two winners will be announced on Monday 10/27 over at Purple Onion Designs Blog. 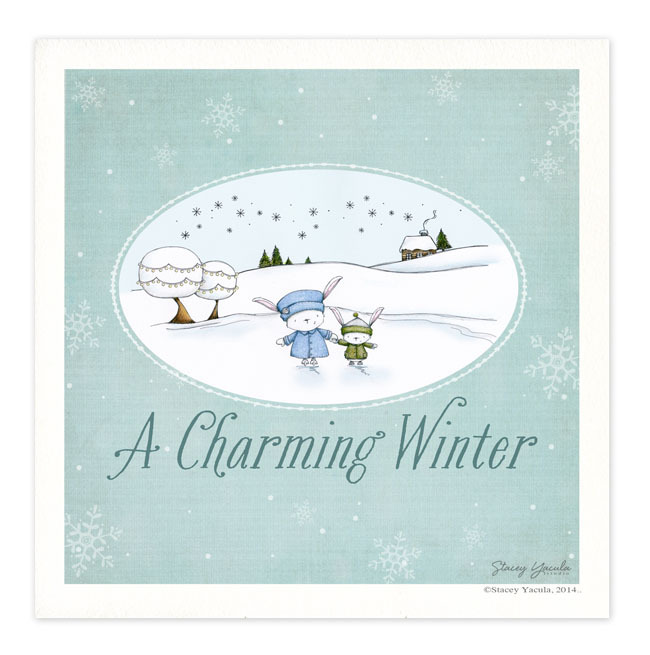 A Charming Winter will be available to purchase on Wednesday, October 29th. 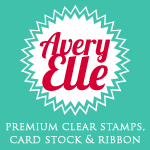 You all are going to LOVE the new stamps...I can't wait to show you the samples. 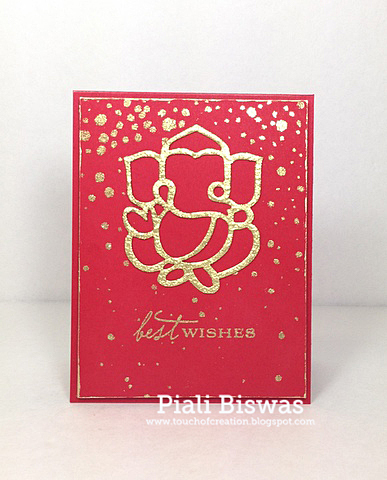 Welcome to Diwali Bloghop 2014!! We are all blog-hopping today to celebrate Diwali, the festival of lights! Join in and participate in the hop to learn more about the festival and see some beautiful ethnic creations! Thank you Chaitali for hosting this beautiful hop!! I'm far way from my Homeland, India...here in NJ, we don't get to celebrate Diwali exactly how we used to do it back home but I try my best to do everything so my girls know all about the traditions...I make lots of traditional sweets for family & friends, we make Rangoli together and decorate the house in evening with candles and diyas. 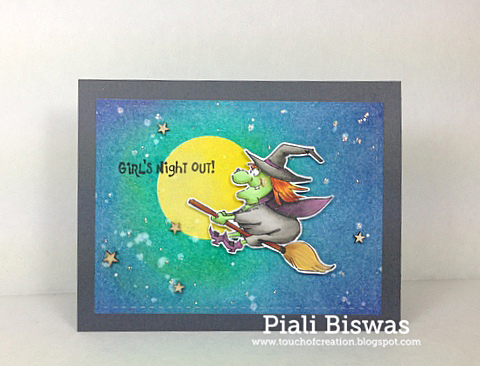 I loooove how this card turned out! Gold and Red looks gorgeous and very festive!! 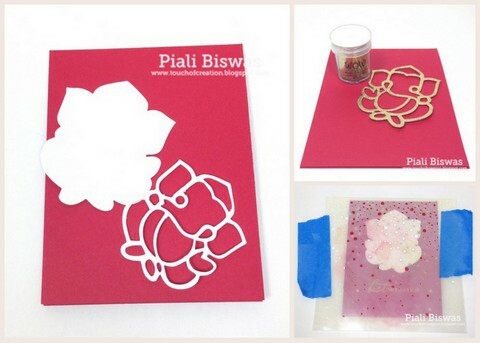 Here are the step-by-step pics that will explain the process of making.. I created cut file from a free clipart image , I modified the image a bit to suit my requirements. Cut three dieuts and adhered them together with Multi Medium Matte..best adhesive for this. I also created a stencil/mask by tracing the outer edges of the Ganesha. I used Silhouette studio designer edition for this. I heat emboss the outline diecut using WOW- Gold Sparkle EP, I used several layers of embossing powder to create a faux metal look. 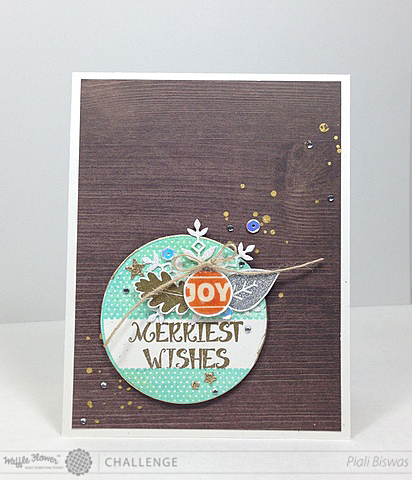 To create the gold sprinkled background, I used Simon Says Stamp snow stencil. I used the solid diecut to mask off the area where I didn't want the gold sprinkles. then placed the stencil over it and applied Versamark ink and WOW- Gold Sparkle EP, heat embossed it. Also heat embossed the sentiment. I also made a home decor with the same cut file.. I cut it larger than the die cut in the card, Heat embossed it on both the sides using WOW Gold Sparkle embossing powder. 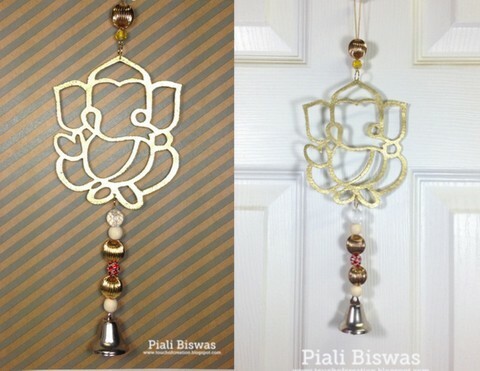 Add few beads and a bell to make a door/ wall hanger . First pic. shows it up close and second one is how it looks hanging on the door. Hope you liked these projects !! Please hop along to see all amazing projects created by a very talented group of crafters. Happy Diwali to all who celebrates!!! Hello and Happy Wednesday Everyone!! Its time for a new Waffle Flower challenge!! Love the inspiration pic and White space is one of favorite style to create in. Here is my first card for the Photo inspiration..
gold metallic ornament top, like real ones. Deep Ocean Challenge : Christmas in October. 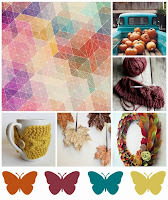 Next card is for the White space challenge..
You all know by now that I love, love, love fall colors & leaves!!! 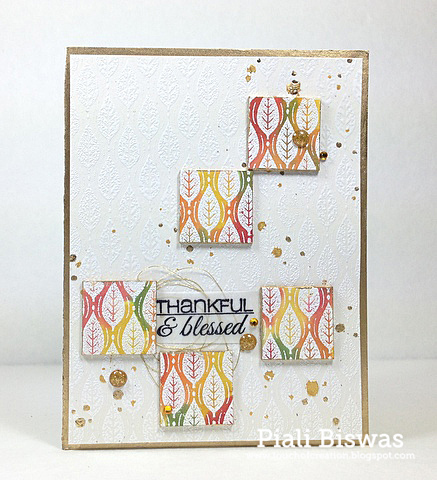 I used the leaves and sentiment from Holiday Labels – Give Thanks Stamp Set. Stamped then with distress inks. I also stamped some outline leaves in black from Flower Circles Stamp Set. The label die is from the new release...Holiday Label 1. I created the splatters with the tiny dot cluster stamp from the Starry Night set. I love how I nice the stamped splatters look like! TimbroScrapMania Stamping Challenge - Fall is in the air. WF challenge runs from you can find all the details HERE. 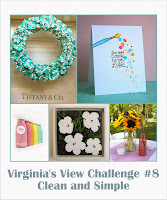 Make sure to check out the amazing DT creations over at WF Challenge blog. I usually don't finish the inside of my card, I keep it blank for hand written message. For this card ...I did finish the inside too. I used Mama Elephant stamps and Basic Grey-Second City papers. I love this ME stamp set... super cute! 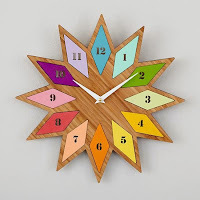 I love this Second City paper collection , very colorful and fun!!! 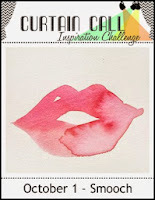 Mama Elephant and me challenge: Anything goes. Addicted to Stamps - Anything Goes. 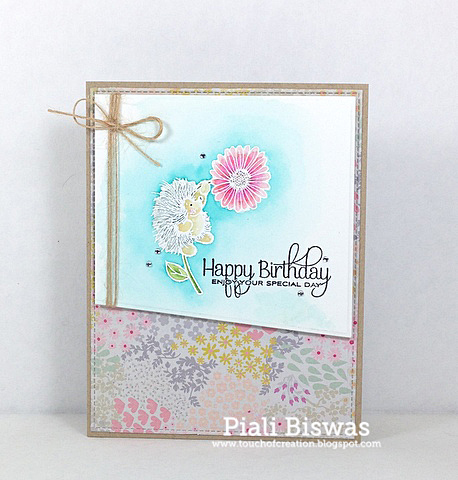 Happy WCMD Piali. Love both of the cards. Love the watercoloring on the first...beautiful. I love FTHStamps and birdbrains. Please email me at piali(dot) biswas(at) yahoo.com. I'll mail your package ASAP! Stop by tomorrow for a fabulous blog hop with a great prize!! I have a Happy News to share with you all!!! 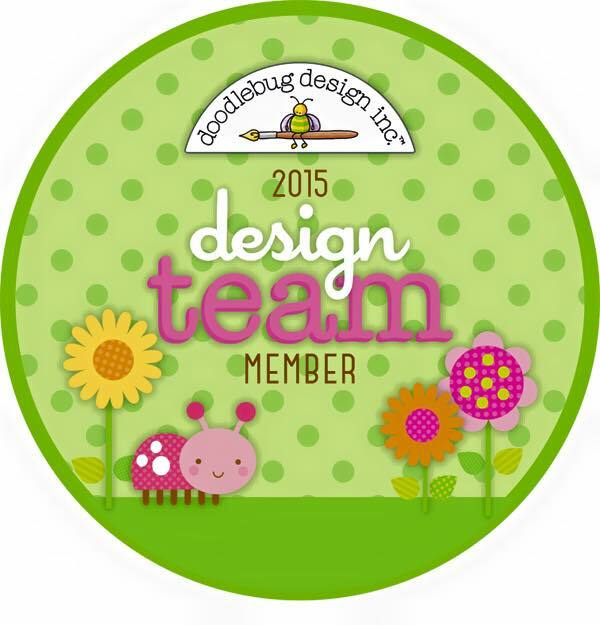 I'm SEI Design Team Member now. 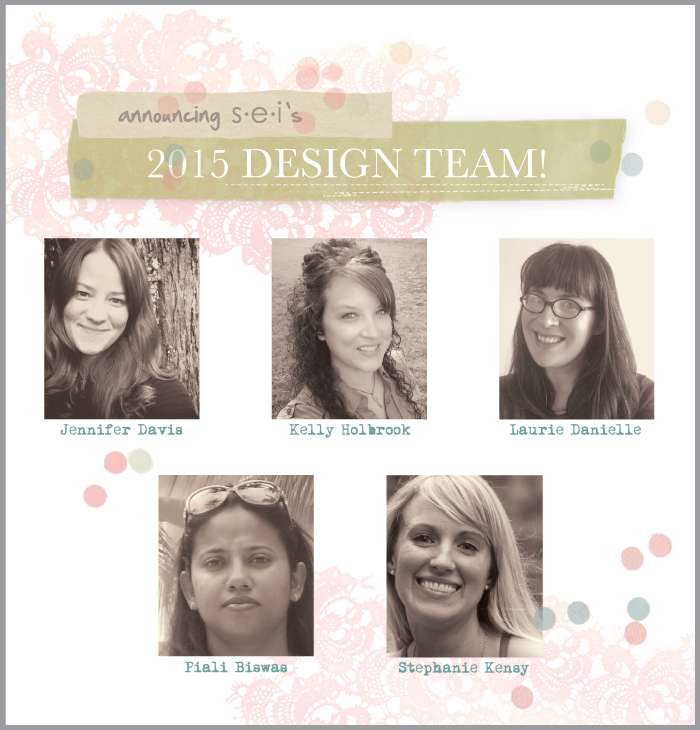 Please hop over to S.E.I Lifestyle Blog to meet the other talented Team members. 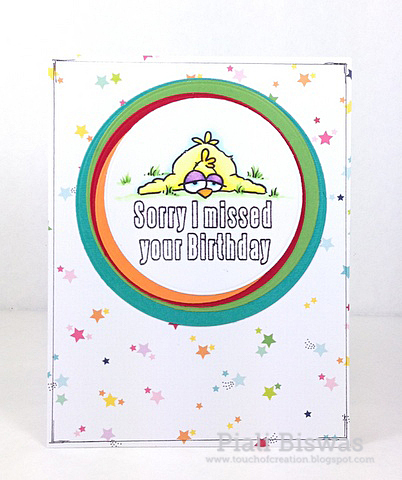 I have a super fun card to share with you all!!!! 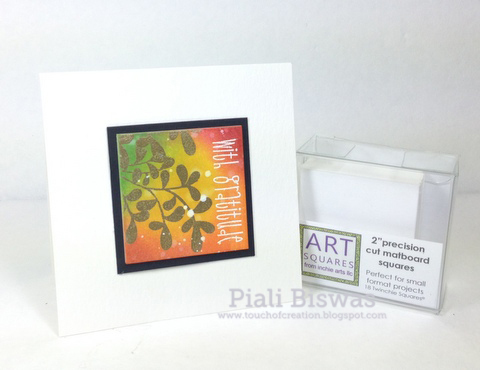 Its a new released stamp from Art Impressions. How fun is that sentiment... super funny Halloween set!!! I don't make many Halloween cards, so this year I didn't buy any Halloween papers yet. I just used Distress Inks with bit of masking to create night sky background. Very clean and simple..yet cute card!! I also added few wood veneer stars and Stickles. One Crazy Stamper - Halloween/Christmas. 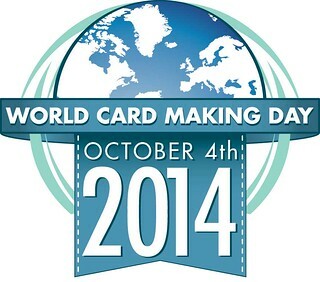 Happy World Card Making Day !!!! 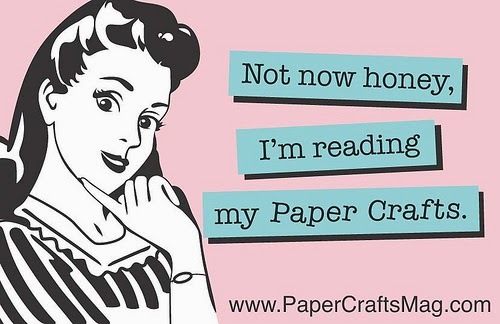 Hello Crafty Friends!!! Hope you all are enjoying WCMD!!! I have two cards and Giveaway for you all!! 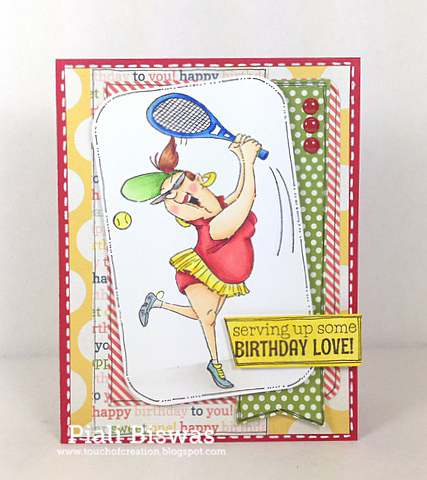 First up is sweet Birthday card using Great Impressions Stamp..
Quick and easy card...with a little water coloring and white heat embossing. The sentiment is from Papertrey Ink and paper from Crate paper. Moving along with the Times - Hedgehogs. The cute Bird digi image is from " From Your Heart Stamps". The sentiment is from Paper Smooches and the lovely paper is from Avery Elle. Please leave a comment by October 7th, 2014. 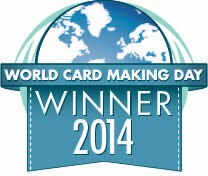 I will announce the winner here on October 8th, 2014. Two great themes... Inspiration and Sketch. Playalong with BRI to win two great prizes!! There are so many lovely Giveaways & Challenges happening all around the blog land...go make cards and enjoy!! !